I'm always adding to our home library. It's an obsession of sorts. A delight. A JOY! I love reading, I love reading with my kids and I love imagining the time we will spend reading together in the future. I'm always on the lookout for new books for us to read. 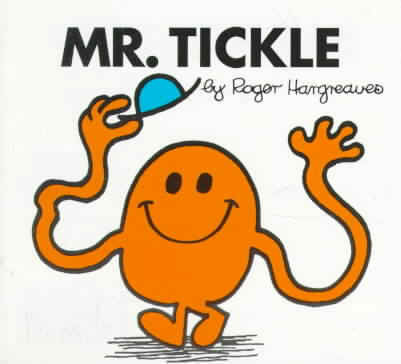 Mr. Tickle . My four year old has finally grown up enough to enjoy the Mr. Men and Little Miss books. (For you do realize that you do have to be grown up to appreciate them, don't you!?!) We've been collecting these books here recently but we did not have what is apparently the first Mr. Man in this fantastic series. Mr. Tickle sparked the rest! I didn't know that. Anyway, now we can indulge more knowledgeably. 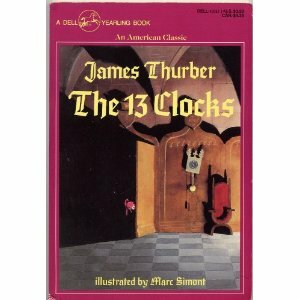 The 13 Clocks , by James Thurber. I'd never heard of this one before but the description on the back made this one entirely too appealing to pass up! "How can anyone describe this book? It isn't a parable, a fairy story, or a poem, but rather a mixture of all three." Hmmm....I'm rubbing my hands together in anticipation and glee! 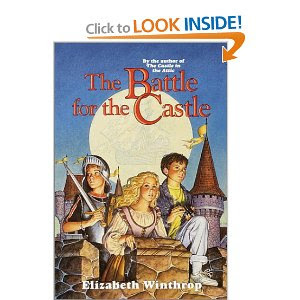 After I read and reviewed The Castle in the Attic (linked to my thoughts) I was informed that there was a sequel, The Battle for the Castle . Had to pick up a copy of that so that we can read on with this marvelous story. 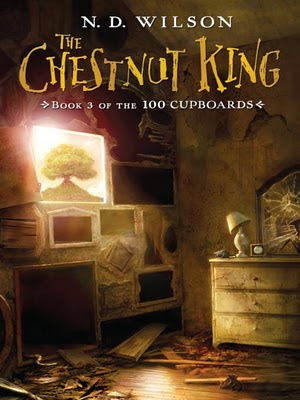 The Chestnut King is the third book in the 100 Cupboards series by N.D. Wilson. I confess that I have only read the first, we own the first two, and Jonathan has read all three. (He liked them.) SO I picked up the third book so that we'd own the whole set. I feel a sense of completion. Yes, yes, I do! Miss Bianca and the Rescuers box set which includes five of the nine stories in the series. Way back in 2006 (ha!) I wrote a not-descriptive-enough-for-even-ME-now post on The Rescuers. (Linked for tradition sake.) Now that I'm keenly aware of books based on Disney movies, and loving The Rescuers (and The Rescuers Down Under) I'm very excited to have found these. 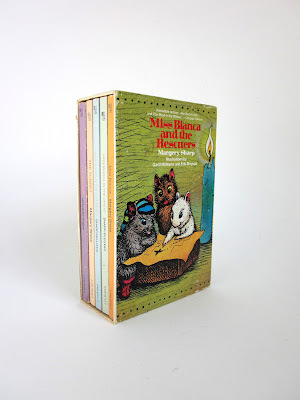 By the way, if the cover art on these books looks a bit familiar to you - it's because the books bear illustrations by the likes of Garth Williams. Such a fun trip! Such a fun treat! Thanks, Jonathan, for the gift. And now! TO THE BOOKS! Added anything to your collection recently that you want to tell me about? You may confess now. But then again, perhaps you don't want to.... (sometimes I don't like confessing how many books have, er, found their way into our home!) Birthdays are a marvelous excuse! 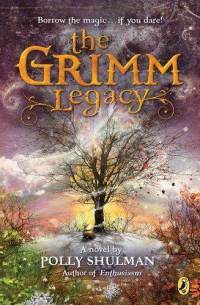 I am SO very jealous that you have The Grimm Legacy!! ;) I really hope you like it, because its one I'm very excited to read eventually. I know almost nothing about the book, either. Several of the others look like fun reads, too. I've been curious about the 100 Cupboards series. It's only been in the past month that I learned who Garth Williams is. How fun! Whenever I visit some friends up near Portland, visiting Powells is always on my list of things to do. It's the best bookstore! What a sweet husband to treat you to such an outstanding early birthday gift. He knows that books are your love language! I've been stocking up on Christian fiction at prices of $4 and under for pretty recent titles. So I have a stack to read, but I am always on the lookout for more. Sounds like a great b'day trip! I finally made it to the Border's going out of business sale and stocked up. There were one or two Jane Austen classics I had read from the library then decided I wanted to own. I got another Siri Mitchell book -- I've just read two of hers in the last few months. Then there was another intriguing one having to do with letters from Louisa May Alcott's family -- I think some distant descendant found them in an attic or something. I can't remember now if it is a novel or a true story...will have to look later. The Grimm one looks interesting to me! The last two times I've been to Portland I haven't stopped in there. It's a real tragedy. I can attest to The 13 Clocks being outrageously great. And...now I'm hoping you don't read it and think, "Wow, she is SO weird." I remember really enjoying the 13 Clocks. It wasn't that long ago that I read it either, though I can't remember the details now. Best birthday gift ever is right! How much fun!! I can't wait to visit Powell's when I'm in Portland later this year.